The obverse features a princess carrying a hedgehog in her apron, a semi-circled inscription LATVIJA at the top left and the year 2016 at the bottom left. The reverse shows a herd of pigs led by a hedgehog and a fragment of an ethnographic building on the right. The design is topped with the inscription 5 EURO, and the words in Latvian EŽA KAŽOCIŅŠ (HEDGEHOG'S COAT) are semi-circled along the bottom edge. It was rolling in a ball. That's what we learn about the hedgehog from a folksong. This needle-coated animal has always been much loved. Urbanisation notwithstanding, many people have had their own personal encounters with this strange creature. Almost anyone who has met a hedgehog in a Latvian landscape or near a country house or a kitchen garden, has developed fond feelings for it and has wanted to take care of it, feed and domesticate it. A cautious animal, the hedgehog often gets used to the role of a family friend. The hedgehog is often ascribed positive characteristics of humans: wisdom, diligence, kind-heartedness. It has become the symbol and role-model for these virtues. In Latvian fairy tales, the hedgehog is also depicted as a clever and sly character: quick thinking, imagination and the help from a friend allow him to win a race with the fast moving hare. In another fairy tale, resourcefulness, courage and patience let the puny hedgehog marry a princess and himself turn into a stately prince. The plot involves a childless couple who finally get a son – in the form of a hedgehog. Even though small of stature, the hedgehog is so agile that, as he grows, up he manages to herd pigs in the big forest. Once upon a time, the king of the land somehow has got lost while hunting and asks the little swineherd to show him the way to the castle. The hedgehog is happy to oblige, but asks the king's daughter's hand in marriage for a reward. The king finally relents and accepts that condition for getting back home. The day comes when, wearing his Sunday's best, the hedgehog drives to the castle in a birch-bark cart pulled by two black roosters. He marries the princess, but at night, while the hedgehog is sleeping, the bride throws his prickly coat into the fire. The coat burns, and the hedgehog also suffers great torment. Yet after the sun has set, he is miraculously cured and becomes a handsome prince. The prince invites his own parents to the castle and everyone lives happily ever after. This Latvian fairy tale has been included in the UN anthology of fairy tales and legends "Ride with the Sun II". Its literary, authored versions have also gained popularity, with Vilis Plūdons's long poem (1921) being the best well known. Its emotional message is undoubtedly directed at a children's audience. A puppet animation was made after it in 1972 and a three-dimensional computer animation in 2005. The musical by poet Māra Zālīte written in 1991 already carries the idea of Latvia's renewal, with the fairy tale plot expressing socially topical themes and ideals of freedom. 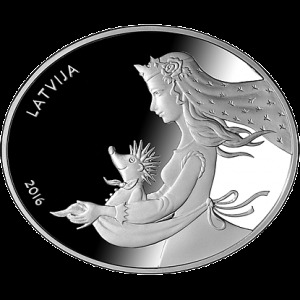 In 2012, Latvijas Banka put into circulation a 1 lats coin with the image of a hedgehog on the reverse. Now its euro fairy tale series is supplemented by an oval 5 euro silver collector coin with the protagonist of the fairy tale "Hedgehog's Coat" on it. It is an old folk tradition that one should also have a hedgehog's needle in one's hem or mitten – then the wearer will have good luck. 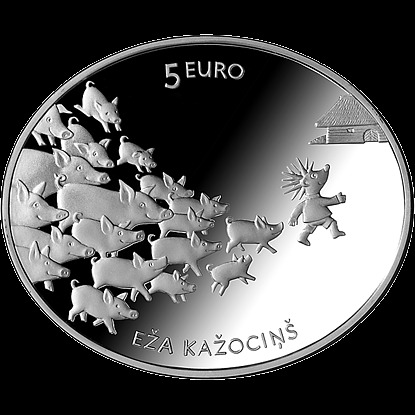 In order to protect the prickly coats and for Latvian hedgehogs to do well, now it's possible to use the coin for good luck.